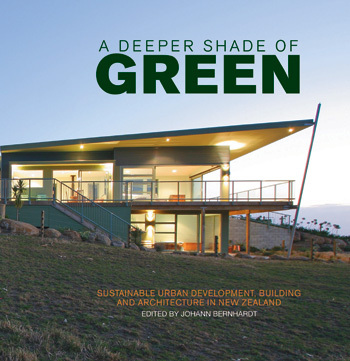 On May 21st of 2008, the very first comprehensive book on Sustainable Urban Development, Building and Architecture in New Zealand was launched at the Council chamber of Waitakere City by Mayor Bob Harvey and Johann Bernhardt, the editor of the book. The year 2007 might go into history as the pivotal point when environmental sustainability moved from a fringe issue to a central position of public concern. Given the huge scope of global and local environmental problems, and the equivalent monumental scope of ‘repair' costs looming, government, business and individuals have come to realise that the time for procrastination is past. While all sectors of society face challenges, the building sector plays a particularly important role. Green building concepts have been applied in New Zealand for many years and environmentally-friendly houses and buildings can be found across the country. But existing regulations and rules, prevailing technologies and building materials, general levels of expertise and training, and conventional investment considerations have not been conducive to achieving high levels of sustainability. We have been limited to reducing impacts, limiting damage and improving quality, which is a laudable start, but nothing more. Apart from a few notable exceptions, the level of sustainability we have achieved in New Zealand so far must be classified as a ‘light shade of green'. The time has come to accelerate the drive and to continuously aim for ‘A Deeper Shade of Green'. This book is intended as a catalyst in the process. It offers an introduction into the new realm of sustainable thinking, concepts and solutions. It aims to give as wide an overview on sustainable topics and issues as possible, and covers the world of building-related activities, from questions of urban development to neighbourhood concepts, to housing options, to the design of public and commercial buildings, identifying alternatives for sustainable energy-, water- and material-use along the way. It initiates a process of reflection on how sustainable concepts influence the built environment and architecture around us and what the future of sustainable architecture might look like. This book is also directed at a multitude of stakeholder groups whose contributions are all vital for a successful shift. They include central and local governments, professional groups, manufacturing and construction industries, investors, non-government organisations and the general public. Finally, it offers a glimpse of what we have achieved to date in New Zealand with a selection of sustainable projects featured in a series of case studies across the spectrum of urban development, housing and public and commercial buildings. The knowledge-base and expertise on the wide range of sustainability concepts across the building sector has, over the past years, seen enormous progress. Many people and organisations have prepared the ground for industry-wide application. The book reflects this collective achievement, and is a true team effort. 50 contributing writers are all leading experts in their fields. They direct the pre-eminent architectural firms in this country on their path to sustainability, they are research fellows and teachers at our universities, they advise Government on sustainability issues, they run successful private research and consultancy operations and, most of all, they are involved in leading-edge sustainable development projects up and down the country. They all share their expertise and experience in the interest of progress. It includes a foreword by Waitakere City mayor, Bob Harvey. The book has been produced to the highest possible standards with about 300 colour photograps, plans, graphs, illustrations and many relevant webpages for further and detailed exploration. Images and language throughout the book help to make it a useful and practical resource for both building professionals and the general public alike.